Description: Electric rays have rounded disc-like bodies and smooth skin and two dorsal fins located on a short, thick tail. The upper surface of the ray is dark greyish-blue to dark brown and the underside is white. Adult fish can be up to 2m long. Habitat: The electric ray is usually found on sand or mud at depths between 10-350m. It catches and envelops bottom-living fish in its pectoral fins and delievers a powerful electic shock from the electric organs located in the pectoral fins, stunning or killing the fish before it eats it. Distribution: Although this species has been recorded from all around the coasts of Britain and Ireland it is rarely encountered by divers. 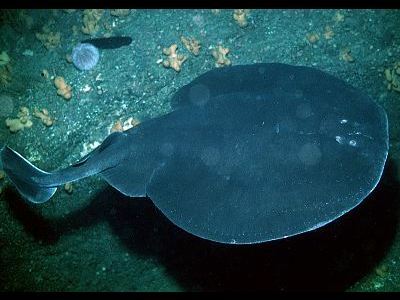 Similar Species: The marbled electric ray (Torpedo marmorata) is similar in shape but can easily be distinguished by its marbled coloration and papillae-like processes around the inner edge of the spiracles. Picton, B.E. & Morrow, C.C. (2016). Torpedo nobiliana (Bonaparte, 1835). [In] Encyclopedia of Marine Life of Britain and Ireland.